Vina Jie-Min Prasad is a Singaporean writer working against the world-machine. She is a recent graduate of the Clarion West Writers Workshop, and she’s already drawing attention for her 2017 stories “Fandom for Robots” and “A Series of Steaks.” Her beautifully crafted fiction shows remarkable range both in ideas and in tone, and the worlds she creates are vivid and compelling. “Pistol Grip” is her second appearance in Uncanny. Uncanny Magazine: The opening of “Pistol Grip” is very visceral and attention-grabbing. Did the idea for the story start from that opening, or did you start with something else? Vina Jie-Min Prasad: Yes, it did—the opening came to me when I was thinking about ideas for cyberpunk-adjacent stories. I wanted to do something weapon-heavy and constantly on the attack, so this opening fit with what I was going for. The question was where to go next, because it’s a really hard opening to follow. Tonally “Pistol Grip” is similar to the ending bit from “How Did We Get So Dark” by Royal Blood—intense but controlled, ramping up to a conclusion that contains some part of the beginning. I listened to that song a lot when writing this. Uncanny Magazine: What do you hope readers will take away from this story? Vina Jie-Min Prasad: A lot of this story is about perceiving what’s beneath the surface. I hope readers will have enough patience and empathy to understand what this story is trying to portray, and what kind of story it is at heart. I also hope that they’ll get a craving for more cyberpunk. Ever since I watched Ghost in the Shell at a formative age, it’s been the subgenre of my heart. Uncanny Magazine: You recently attended Clarion West, an intensive six-week writing workshop. Was this one of the stories you wrote at the workshop? What made you decide to take the workshop, and what do you feel you got out of it? Vina Jie-Min Prasad: “Pistol Grip” was the final story I wrote at Clarion West. I redrafted it a bit, but the bulk of it is unchanged from then. I decided to apply to Clarion West because I wanted to meet and learn from other writers. Before Clarion West I was writing solo, and I’d hit a wall in terms of writing. It’s kind of hard to progress beyond what you know when you’re largely self-taught and most of your feedback comes from rejection emails. I can’t say that Clarion West is a magic bullet for writing in itself—what you get out of it is related to what you put in—but the workshop gave me a greater awareness of the range of processes that people had, and a bigger arsenal of techniques I could use in my writing. It was an awesome experience and I super recommend it for writers who are trying to get to the next level! Uncanny Magazine: I love writers who can pull off a wide variety of stories, and your work covers a wide range both in topic and in tone. That said, writers also have things that carry across their stories, elements of style or themes that are revisited. What has a tendency to show up repeatedly in your stories? Vina Jie-Min Prasad: So many things—music references, food scenes, queer themes, metafiction—but the number one thing that keeps showing up is, I guess, subjectivity. My background is in historical research, so listening to oral histories and reading accounts of the same time period made me aware that the way people experience things is defined by their previous experiences and frame of reference. I really like to play with subjective descriptions of things and flavour the narration according to how a character would perceive it—and of course, writing unreliable narrators trying to justify their actions to themselves or disguise their real intentions is very very fun. 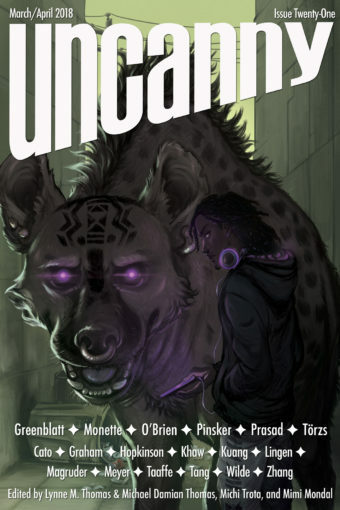 Uncanny Magazine: This story has original characters, but also bears strong similarities to hurt/comfort fanfiction. Another of your Uncanny stories, “Fandom for Robots,” also shows a deep familiarity with fan culture (though with a very different overall tone). Do you have a favorite fandom? Do you write (or have you written) any fanfiction? Vina Jie-Min Prasad: Harry Potter was the first series that got me really interested in fan discussion and fanworks. I got into the fandom during what’s known as the “Three-Year Summer”—the three-year-long gap between Goblet of Fire and Order of the Phoenix. The ending of book four opened the universe up so much, and it was such a cliffhangery point to leave off that I signed up for forum accounts and started reading fan theories and fanfiction about what book five might be like in order to quench my thirst for new canon. I wasn’t writing back then, though. In fact, I didn’t start writing any fiction until the release of the J. J. Abrams reboot of Star Trek. It was a whole new universe to play with, without a ton of canon and canon tie-ins to learn about, but also with a lot of older canon that could be used for inspiration and reference. Looking at the other fans playing around in that universe and how much fun they were having made me realise, hey, maybe I could try writing fanfiction, so I did. I don’t write a lot of fanfiction nowadays—I’m not exactly a fast writer, and a lot of the series I’m into are satisfying on their own without the need for theorycrafting or filling in canon gaps. I don’t subscribe to the narrative that this means I’ve “graduated” from fanfiction writing and moved on to original fiction—I think that’s an overly simplistic way of looking at things (and if I found the right fandom or ship I’d jump right back anyway). I believe fanfiction is worthwhile in its own right, and I’m very proud that I got my start in it. 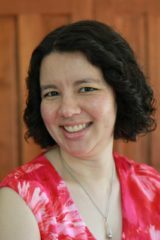 Vina Jie-Min Prasad: Solo-wise, “Pistol Grip” was the last thing I completed—I have a few stories from Clarion West that are sitting on the backburner waiting for their next draft, and I’ve had some ideas for new stories, but nothing solid yet. I usually end up writing when it feels like an idea isn’t going away no matter what I do and if I don’t write it no one else will. It really depends on what seizes me first. To be honest, I have no clue what is coming up next, so it’ll be a surprise for everyone!